Describing phenomena from the real world mathematically has a tempting sort of elegance and simplicity, but there’s a danger of oversimplifying. You risk missing out on some of the really complex beauty that’s out there! I always experience a bit of glee when a simple explanation turns out to miss something messy but important, and for that reason I’d like to tell you about defects in crystal structure and why they matter. Awhile back, we talked about periodic structure in solids, and how the geometric arrangement of atoms in a material determines many of the material properties. For electronics, the density of mobile charge carriers (electrons or holes) and the availability of energy states for those carriers to occupy are the two main relevant material properties. From these we can get metals, which conduct electrons easily, or insulators, which don’t, or semiconductors which are somewhere in between. Modern computing is largely based on devices built from semiconductors, connected to each other using metals, with insulators used for electrical isolation and a few other tricks. But while it’s helpful to imagine a perfect material, with each atom positioned just where it should be in an infinitely repeating array, nature is messy. We can learn a lot from theoretical material models, but the materials we find in the real world will be different. We call any deviation from perfect crystal lattice structure a defect, and the interesting thing about defects is that they can affect material properties too, especially with nanoscale objects that can have a high ratio of “defect” atoms to “normal” atoms. There are a few different kinds of defects one finds in natural materials. For example, an atom might be missing from a lattice site which is called a vacancy, or there might be an extra atom where there shouldn’t be which is called an interstitial. There could be a whole plane of atoms that just starts in the middle of the crystal, which is called an edge dislocation. Or two regions with different orientations of their crystal structure might be pressed up against each other, which is called a grain boundary. There are lots of ways that a crystal lattice can get messed up, but remember, for that material, the native crystal lattice is usually the minimal energy solution for packing a bunch of atoms together with those properties. So the most probable outcome for any given region is a perfect lattice, but the material will end up with some deviations from this as well. How many defects there are depends on how energetically favourable the lattice is, but also on how the material was made: if you solidify a crystal really slowly, the atoms are more likely to find the true lowest energy position (sites in the perfect lattice) and there are fewer defects. These defects all matter because they affect material properties, so if we assume that a material is going to behave as it would with a perfect crystal lattice, we are in for a surprise! If we’re focused on practicalities, like whether the material is as electrically conductive as we think it should be, then the type and concentration of defects in the device is very important, because some defects will reduce current flow and others will enhance it. To understand why, let’s think about the physical mechanisms for current flow through a material. In a crystal, we have an array of positive nuclei with some tightly bound electrons that are bound to them; we can call these ‘localized’ electrons because they are staying in the same approximate location around the nucleus. Electrons that were more loosely bound to the original atoms are able to move freely through the crystal; when these ‘delocalized’ electrons move through the material, that is what we can measure as current flow. But a large part of the reason we can even have delocalized electrons is due to the periodicity of the lattice, which mathematically allows delocalized wave states for the electrons. When this periodicity is broken, as it is by dislocations and grain boundaries, the wave states can be disrupted, and new bound states that localize electrons to the defect are created. These are often called ‘charge traps’ because they trap the charge carriers in a specific place. However, if we ‘dope’ a material by carefully adding lots of interstitial atoms that have an extra electron, we can avoid disrupting the wave states for electrons, but add more electrons total, which actually increases the conductivity of the material. So in device manufacture, controlled doping is a common use of defects to affect material property, but dislocations and grain boundaries are often avoided because their effect on the material property is usually undesirable. In nanoscience defects are even more important, because with a nanoscale object that’s just hundreds of atoms across instead of hundreds of billions, the percentage of atoms that are in non-ideal crystal sites can get pretty high. For example, many surface atoms end up as defects that trap charge, and a nanocrystal may be 30% surface atoms! So lots of nanoelectronics research is focused on minimizing the negative impact of defects. However, there’s an interesting contradiction there: the fascinating thing about nanomaterials is their quantum-like properties compared to bulk materials. But quantization in nanomaterials stems largely from the greatly increased number of grain boundaries and surface atoms and defects, because these things all increase as you scale down the size of the material. So there’s a careful balance between mitigating the negative effects of defects, and not getting rid of the nanoscale-specific behaviors that make nanoelectronics interesting in the first place! 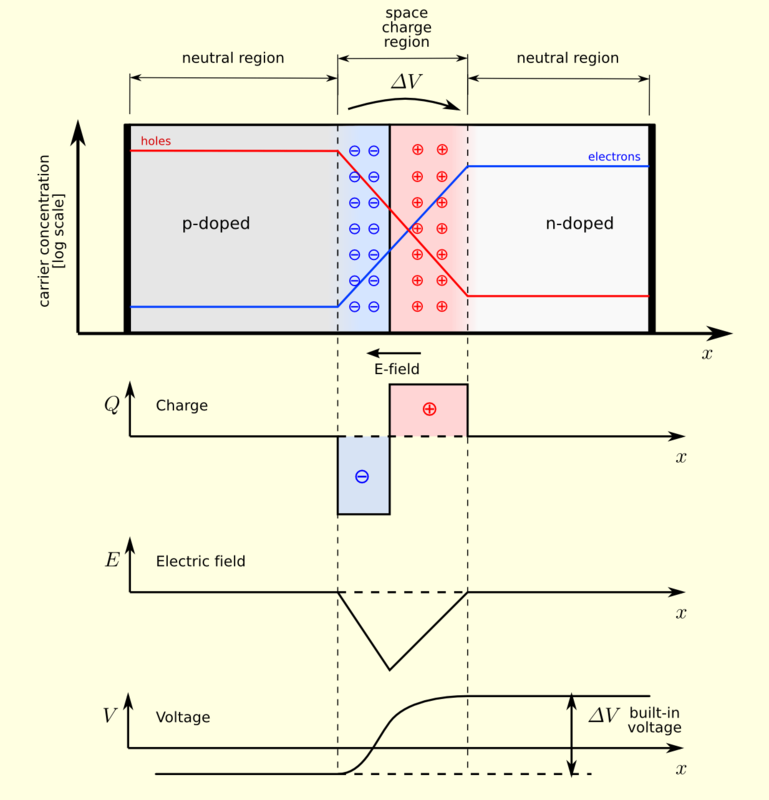 Last time we mentioned n-type semiconductors, which have electrons as the charge carrier, and p-type semiconductors, which have holes as the charge carrier. But what happens when you put them together? The result is a device which underlies much of modern electronics! 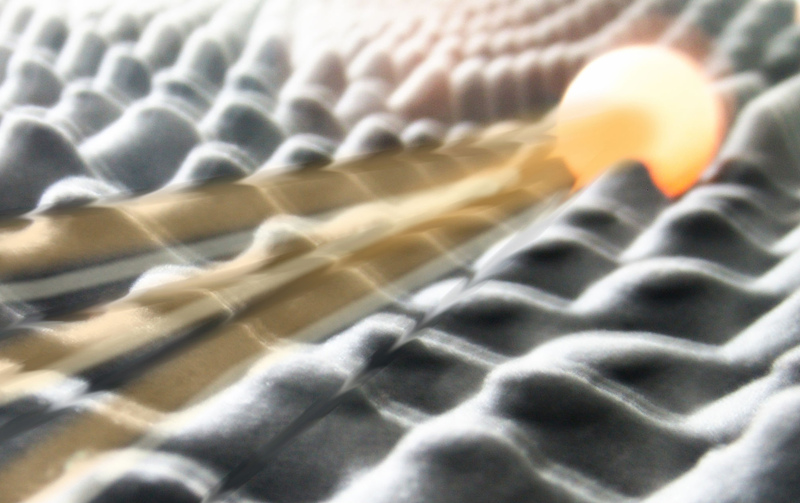 Imagine a block of an n-type semiconductor pressed up to a block of a p-type semiconductor. What happens when the two make contact? Each material is electrically neutral, but the holes in the p-type material provide additional electron states which draw electrons from the n-type material. And when electrons travel into the p-type material, they leave holes behind them in the n-type material. Thus, at the interface the p-type semiconductor gains a negative charge, and the n-type semiconductor gains a positive charge. The region where this happens is called the space charge region. Even though this isn’t the lowest energy charge distribution, it is the lowest energy overall because it makes use of more available states for both electrons and holes. (The rigorous version of this argument involves entropy, which I hope to dedicate a post to very soon!) So now the interface looks like a cluster of positive charge next to a cluster of negative charge, which creates an electric field across the junction! If we want to pass current through the p-n junction, that electric field is going to either help us or hurt us depending on which direction we want the current to flow. If the current flow is in the same direction as the force applied by the field, then current will be aided by the presence of the junction. But if the current flow is in the opposite direction, it will be impeded. This kind of device is called a diode, because it can either conduct current or block it depending on the direction of current flow. Of course, since the size of the electric field in the junction is limited by the interface size and the charge carrier concentration, if we apply a strong enough external electric field then we will be able to pass current through the device in both directions. This is called breakdown, and while ideal diodes are assumed to never exhibit breakdown, real diodes do because of the physical nature of the system which in p-n junctions means the finite size of the junction’s electric field. So a p-n junction acts like a normal semiconductor with applied voltage in one direction, and in the other direction passes no current until a high enough voltage is reached to induce breakdown. Diodes are a building block that can be used to make a more complex electronic circuit, just like inductors, resistors, and capacitors. But p-n junctions specifically are the building blocks of most digital circuits in silicon! More on that coming soon! So far when we’ve talked about electronic properties of materials, we have emphasized electrons as the carriers of charge through the material. As we know, in atoms, nuclei are big and mostly immobile, whereas electrons are small and exist in a probability cloud around the nuclei. Thus the mobility and number of electrons, plus the available energy states, are what determine how easily electrons can flow through a material. And this decides whether something is an insulator, a metal, or most interestingly a semiconductor. But consider a material that has many, many electrons, one in which the band of electron states is nearly full with only a few vacancies. Even with an applied electric field, very few electrons will be able to go anywhere if there are not many available states to move into. A material like this would be nearly an insulator. But we may see one electron move over into an empty state, then a second electron move into the state vacated by the first, then a third electron move into the state vacated into the second, and so on. The motion of the electrons is causing a net charge flow, but no individual electron is able to get very far because of the dearth of available states. From a distance it might almost appear as if the empty space without an electron is what’s moving. This is similar to a very common occurrence, in fizzy beverages such as soda or beer. Bubbles form, and once they detach from the sides of the container, they rise up through the liquid. But the force causing this motion is gravity, which doesn’t affect the gas in the bubbles as much as it affects the relatively dense liquid around them. In order for the liquid to fall, the bubble must rise. Or, imagine a row of seats, with a middle seat unoccupied but all the other seats full, in a narrow space that makes it difficult to get past occupied seats. A person next to the empty seat could move over, and then the person next to them can move over, and so on. It is the people that are doing the moving, but if we wanted to describe the motion it would almost be simpler to say that the empty seat moves to the edge of the row. There are lots of other examples of the same phenomenon, shown in the diagram below using marbles. Thus, for the materials whose electron states are crowded but not quite full, the empty states are called ‘electron holes’ or just ‘holes’. Holes are quasiparticles, meaning we can treat them as individual particles even though they are really a collection of behavior exhibited by many particles. Conduction of charge still occurs via the movement of electrons, but conceptually and mathematically it is easier to describe the movement of holes in the system. So one can calculate the charge of a hole, which is the opposite of the charge of an electron, or the mass of a hole in various materials, or the hole mobility which describes how easy it is for a hole to traverse any given material. A material with holes as the charge carrier is called p-type, and a material with electrons as the charge carrier is called n-type, because of the positive and negative charges of holes and electrons. Practically, this is an important distinction between different types of semiconductor, and you’ll see how it comes into play in technology when we talk about p-n junctions and finally get to the transistor. But conceptually, I find it really cool that the emergent behavior of a bunch of electrons can be described as a quasiparticle, with its own mass, charge, and electronic properties. It’s elegant and weird, as nature often is. We have already talked about the mechanical aspects of how a solid is assembled from individual atoms, when the atoms are in a repeating periodic structure called a crystal lattice. The lattice type can determine many of the material properties, but one of the most interesting and useful properties to think about is electrical conduction. One of the simplest ways to measure conduction is by creating a potential difference, so that one side of the material is more energetically favorable to charged particles than the other. This is called applying a voltage, named after Alessandro Volta who invented the battery, a device that uses chemical differences to create a voltage. When there is a voltage applied, electrons are drawn through the material, but how many electrons flow (which determines how large the measured electrical current is) varies widely by material. In some solids where electrons move freely, it’s easy to pass a lot of electrons through, creating an electrical current. This is characteristic of a metal, where electrical conduction is easy. But in other solids, it takes a lot of energy to move electrons through so electrical conduction is difficult, and we say these materials are insulators. And there is a third class of material, a semiconductor, which can be switched between conducting and non-conducting states. To understand what causes the different electrical behaviors, we can think about how the atomic energy states available to electrons scale up to a bulk material. Each individual atom has a set of available electron states, that can be mathematically described using quantum mechanics. Some of these states are occupied by electrons, and some are not. A collection of atoms will have a collection of states, some occupied and some free, and an electron has to have available states that it can move between in order to traverse a solid. If there are no available states, it doesn’t matter how energetically favorable it is for the electron to go somewhere else, it has no way of getting there. The various bands of allowed electronic states can overlap with each other, can have a small separation in energy, or can have a large separation in energy. Overlapping bands mean that in both bands, electrons have many available states to transition to, and that is why materials with overlapping bands have high electrical conductivity. These are metals, like gold or copper. For materials with a large separation between bands, the lower energy band is completely full and the higher energy band is completely empty. If an electron in the full band is tempted to move through the material, it must first scrounge up the energy to jump up to an available state, which is so considerable a task that most electrons can’t manage it. These are insulators, which may only pass one electron for every 1030 (a billion billion billion, or more electrons than stars in the universe) that pass through a metal at the same potential. Where the bands of available states fall exactly is determined by the crystal lattice type and the interatomic spacing, two factors which are themselves determined by the outer electrons of the atoms themselves. And for amorphous solids without a periodic structure, like glass, we still get energy bands. In fact, one way to think of the transparency of glass is that visible photons entering the material do not have enough energy to excite electrons from a filled band into an empty band, so they pass through the material without interacting with it. And that’s why you can see through glass! All the justification for band theory involves a lot of math, of course. But just the basic idea, that bulk materials have bands of available states for electrons and the energy and grouping of these states determines electrical behavior, is pretty amazing because it puts a framework around the broad variety of electrical behaviors that we see in materials in nature. And, if you want to understand how electronics work, band theory is the first big piece of that puzzle.